Allentown, Penn. 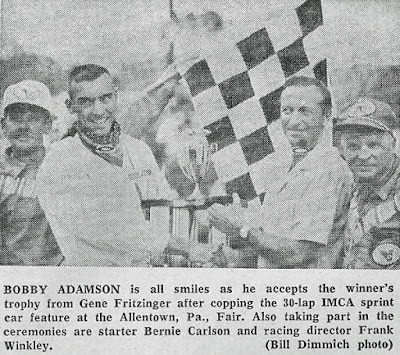 (August 9, 1967) – Bobby Adamson found his super-modified experience quite helpful on Saturday afternoon at the Allentown Fair as he pushed his Hawthorne Chevy to victory in the 30-lap International Motor Contest Association sprint car feature, besting a 19-car field. 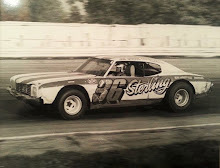 The race was the first in the east for IMCA since the mid-1930’s when they appeared at the Springfield and Brockton, Mass., fairs. 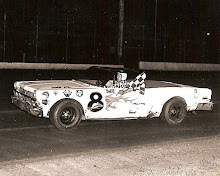 Two other super-modified stars, Gus Linder and Ronnie Rough, took second and third place behind Adamson. A pair of Ohioans, Karl Busson and Benny Rapp, rounded out the top five. 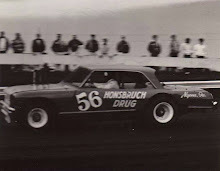 The time for the 30-lapper on the half-mile dirt was 13 minutes and 9 seconds. Busson took the lead at the start with Rapp, Jon Backlund of Kansas City, and Rough right behind. Rough charged past Backlund for third place on lap 2 and took second from Rapp on the next go-round. Adamson was on the move from his ninth starting position and both he and Rough were running one-two by lap 6. Adamson set the pace from that point to the checkered flag. 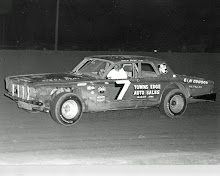 On lap 10 John Wallace blew an engine and spun his Chevy in turn one, collecting Bob Martin in the process. Defending IMCA national champion Jerry Richert won the STP trophy dash but broke the crank shaft on his Wagner Chevy as he took the checkered flag. 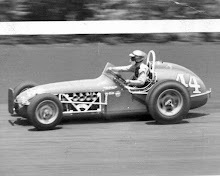 Linder and John Auxter both won 10-lap heat races while United Racing Club star Dennis Zimmerman won the 15-lap semi-main. Defending URC champion Earl Halaquist qualified the fastest of the 27 cars, guiding his Nesler Chevy around the half-mile in 24.59 seconds.